My friend Andy had come up with the idea of an Easy Rider Trip, a journey along the path Wyatt and Billy had taken in the movie "Easy Rider". 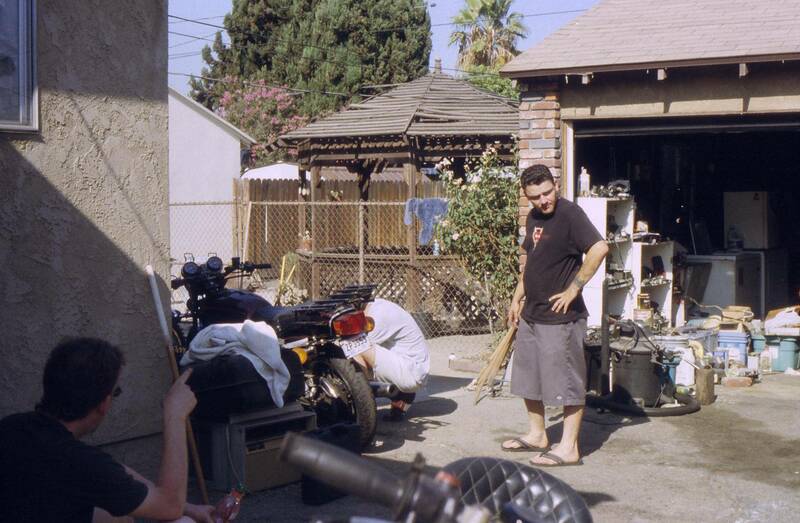 He made his idea public sometime in Spring 2004 on a mailing list which deals with vintage Honda Four motorcycles (the Single Over Head Cam / Four list, or SOHC/4). Soon a lot of people who were interested gathered on a discussion board, and we exchanged route suggestions, bike ideas and dates. Among those who were about go on that trip were not only U.S. residents but also three Europeans, namely Stevie from Scotland, Tim from the UK and me, Axl, from Germany. First, we had to find some bikes. Bringing our own bikes over just for the trip was a bit of an overkill, so we decided to buy bikes in or around L.A. and sell them after the trip in New Orleans. Mark and Fabrizio, both from L.A. had offered to pick up any bike we would find and store it for us. 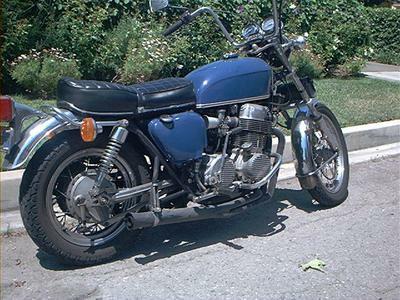 The favorite marketplace for all kind of stuff these days is Ebay, so we kept on looking out for any decent looking Honda CB 750 SOHC bikes. 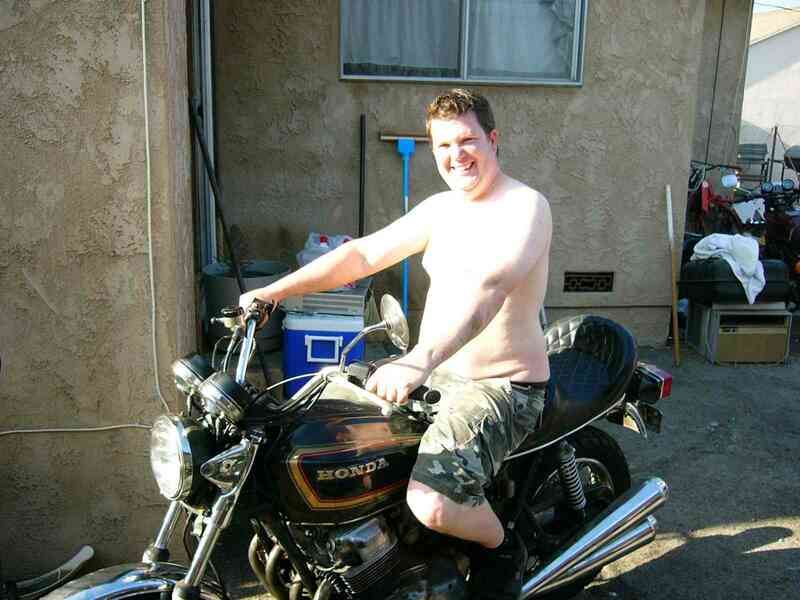 Stevie, who had kept a low profile so far, was the first to find a bike. It was missing the sidecovers, but otherwise looked ok. Well, when the bike was delivered, it turned out it also missed the airbox and headlight, and, above all, a title. But there were still a couple of weeks left to sort things out. 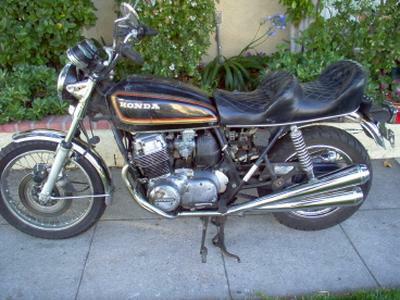 Tim bought a bike from a fellow SOHC/4 guy who also is on the SOHC/4 list, a 1978 F2 model. When it was delivered to Mark, it turned out that it also needed some attention - rear tire, turn signals didn't work and so on. Whooaaa! 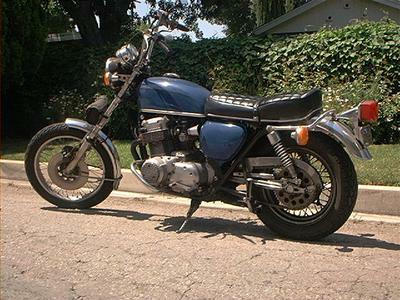 A semi chopped 750, a real piece from the '70s - the perfect bike for the Easy Rider Trip! I had to get it - and I did. 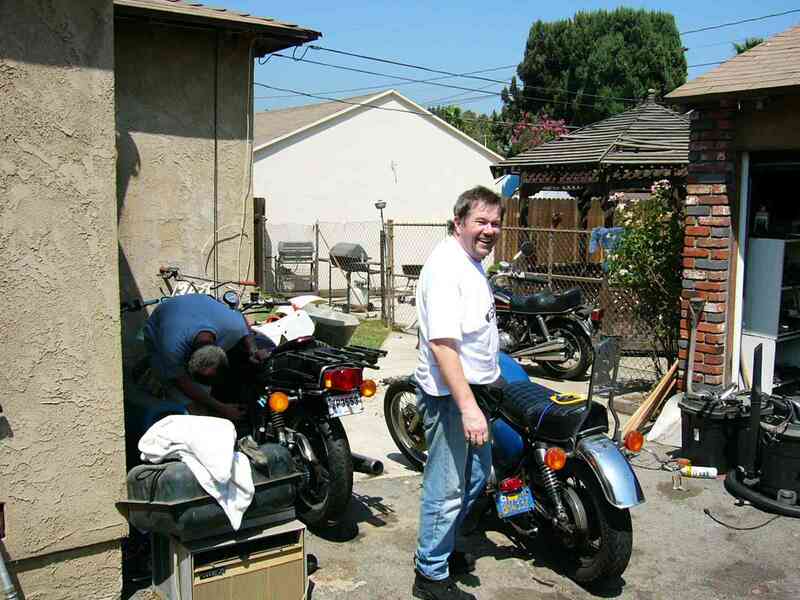 The seller was just a few blocks from Mark's place, and it was "just another bike" which Mark picked up and stored in his garage. Meanwhile, I had given up the idea of selling the bike in New Orleans. First, I had figured that by the time we would arrive in New Orleans, this would be the bike I made the Easy Rider Trip with. Second, the idea of accompanying Andy on his way from New Orleans back to Boston sounded appealing - thus it would be a real ride across America. 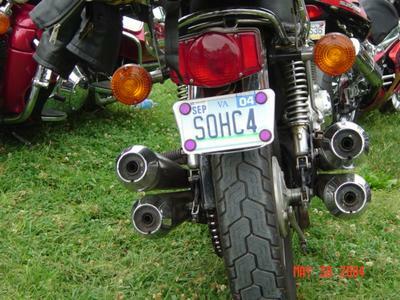 Lastly, I have a habit of hanging on to any CB 750 SOHC bike I can get hold of. Apparently I was the lucky guy - the chopper came with a title, it ran, and everything on it was working. 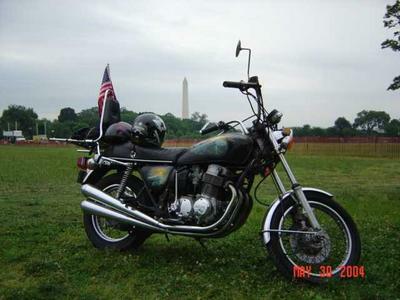 Nonetheless, Mark spent some time customizing it a bit more with a side mounted taillight and a sissy bar Jason had lying around. All these were perfect matches for the chopper! 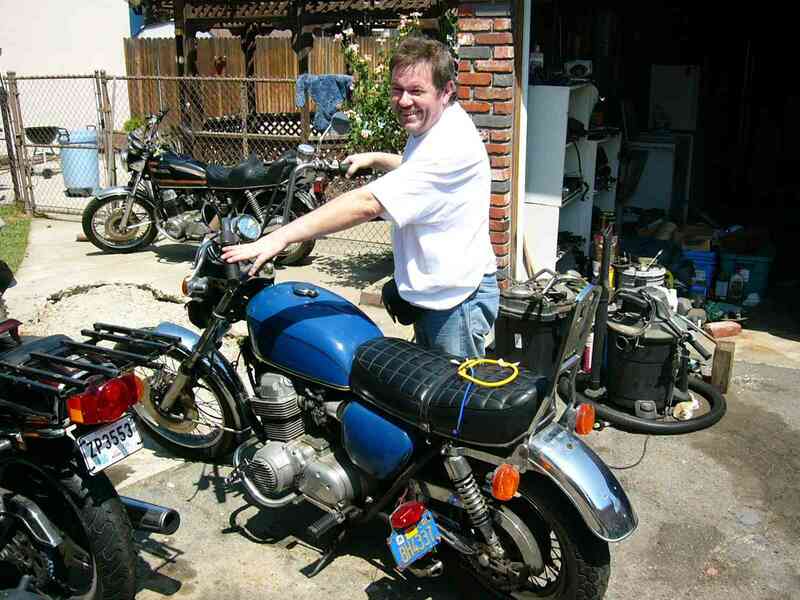 Mark was so busy attending the bikes of us Europeans that eventually he didn't get around to get one of his Honda bikes ready for the trip. 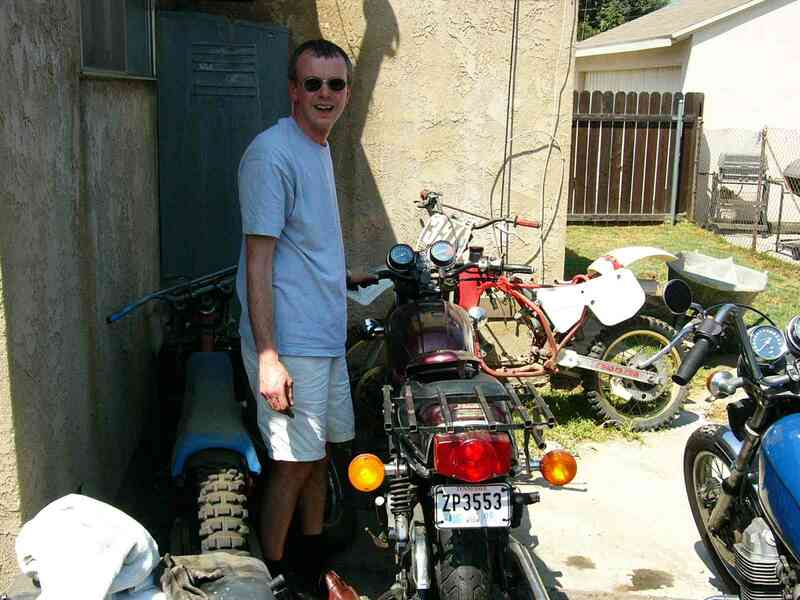 So he ended up taking his beautiful Harley Sportster Cafe racer and lived on pain killers for the next two weeks. Fabrizio had to retrofit his Honda Cafe racer back to a tourer - eventually he had a choice of three different foot pegs: Rearsets, stock pegs and highway bars. Ute was pretty much set up with her nice 550, as were Jason with his beautyful 750 and his dad Jer with a CX500. Andy had shipped his bike from Massachusetts, as did Elwood from Virginia. We all met in L.A. on Thursday, August 26. The trip should start on Saturday, leaving one day for setting everything up and fixing what needs to be fixed. For the Europeans, this was the first time we saw our bikes in real. And there was still a bit to be fixed: Tim had to mount his luggage rack, Stevie's bike still needed the most attention: "Your bike has no brakes, and you have no insurance. I think we should fix your horn." Tim and I took care of Stevie's front caliper, while Stevie himself was busy on the phone getting insurance. Instead of an airbox, we bought a set of foam pod filters - driving through the desert with no air filter at all didn't sound reasonable. I had a bit of surprise when I took the chopper for a first ride. 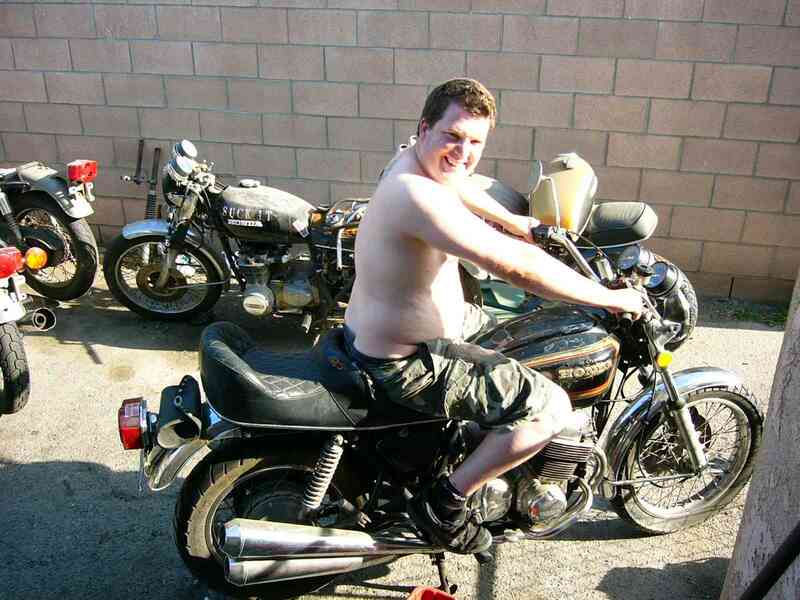 This was the first time I rode a bike with extended forks (all my other bikes are Cafe racers or stock). Whoops - this handles a bit different, to say the least. Good for long straights (of which we should see a lot) but difficult in the curves. Above all, I found that the forks were warped. But the heck - this is a chopper, so go for it!